Noodles and Asian food are two of my favorite things. 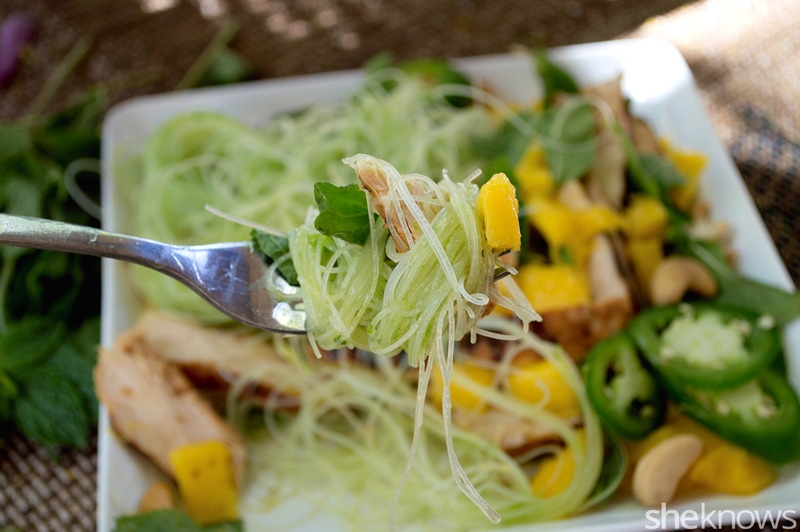 But since they’re not always the healthiest thing, I wanted to get creative with rice noodles and make a light yet filling dish perfect for warm weather. It doesn’t hurt that it’s ready in 20 minutes either. In this dish, I used rice noodles and tossed them in a simple yet super-refreshing mint sauce. To add some protein to keep me feeling full, I used up some leftover grilled chicken from a previous meal and added some fresh diced mango for a sweet contrast. If you don’t want the hassle of preparing chicken, then grab a rotisserie chicken from your local grocery store to save tons of time. Another thing to point out is that once you toss these noodles in your dressing, it’s going to appear that your dressing has vanished. Don’t worry — these noodles are very thirsty and like to drink up sauces. So make sure to not toss the noodles until you are ready to serve them. This salad is perfect for a light lunch, and while delicious, it’s simple enough that it won’t keep you locked up in the kitchen to prepare it. You’re eating in 20 minutes or less. 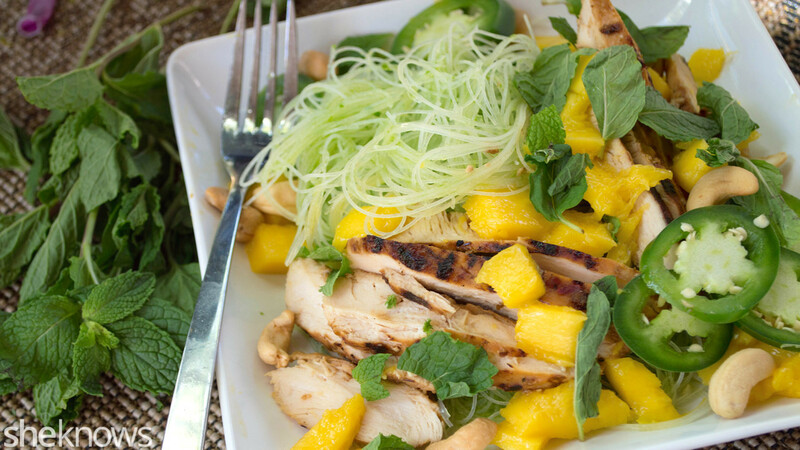 Grilled chicken and diced mango sit on top of soaked rice noodles that have been tossed in a minty dressing. Tip: To make this dish ahead of time, keep the ingredients separate, and then toss when ready to serve. To a blender or food processor, add all the ingredients for the dressing. Blend the mixture on high for 30 seconds or until the dressing is very smooth. Transfer to a jar, and set aside. To a large mixing bowl, add the soaked rice noodles, and drizzle the dressing over the top. Toss well, and add the remaining ingredients to the bowl. Plate the noodles in bowls or on small plates. 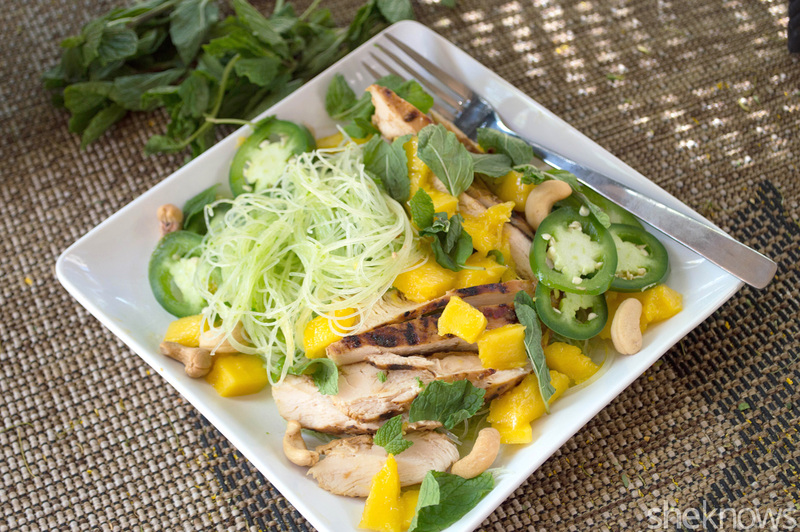 Top with the grilled chicken, fresh mango and jalapeño, and garnish with cashews and extra mint leaves.